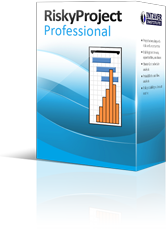 RiskyProject Professional is comprehensive project risk analysis and management software. RiskyProject Professional allows users to perform Monte Carlo simulations of project cost and schedule using discrete risks event and uncertainties defined by three point’s estimates. Cost and schedule risk analysis allows users to create realistic “risk adjusted” cost and schedule estimates to complete their projects. RiskyProject Professional also provides a comprehensive project risk management capability that is compatible with all major project risk methodologies and processes, such as those supported by PMI, Prince II, and ISO 31000. RiskyProject Professional has an integrated fully feature risk register that allows you to perform project risk management. The risk register can be either qualitative or quantitative and can include non-schedule risks, such as reputation, quality, and performance. Risks can be linked to project activities to measure how they will impact cost and schedule as part of the Monte Carlo Simulations. 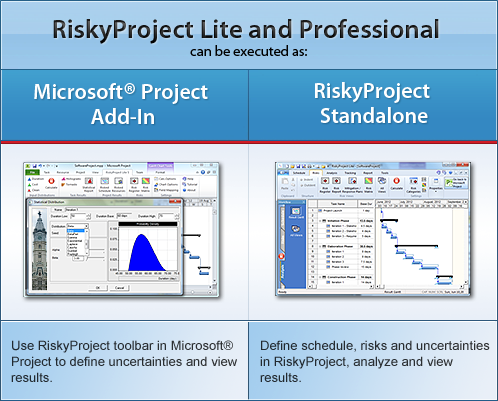 RiskyProject Professional allows project planners and managers to perform integrated schedule and cost risk analysis. With resource loaded schedules, users can link risks from their risk register to project activities and resources, and define uncertainties related to schedule and cost of each task. RiskyProject Professional will provide results in the form of cumulative project cost curves and probabilistic cash flow plots, and joint confidence scatter plots for cost and schedule. In addition, RiskyProject Professional calculates the amount of work for each time frame for each resource, which provides probabilistic work and resource allocation reports. Advanced project risk analysis features also include probabilistic and conditional branching, multiple statistical distributions, probabilistic calendars, risk bubble chart (presents relative task cost or schedule risk of each task vs project cost or schedule), crucial task chart, success rate chart, and other customizable reports and views. RiskyProject Professional provides comprehensive sensitivity analysis on project risks, cost, duration, finish time etc. The results of the sensitivity analysis can be viewed as Tornado charts and are available in a variety of reports. In addition, using the Monte Carlo simulations and sensitivity analysis, RiskyProject Professional will automatically rank risks in the risk register. During project execution, RiskyProject Professional allows project managers to monitor and control their risks, and perform updated forecasts using actuals. This provides update risk adjusted estimates to complete and supports the earned value management reporting process. RiskyProject is built around its own scheduling system. You can define task parameters, relationships between them, constraints, resources, and cost without using Microsoft® Project, Oracle Primavera, or any other scheduling software. After calculation, the risk register will present calculated risk impact, probability and score before and after mitigation. RiskyProject’s Risk Drag-n-Drop is the preferred method for assigning risks to complex projects as it allows you to quickly assign risks to multiple tasks or resources. You can also view a project cash flow. The Cash flow analysis view shows monthly, bi-monthly, quarterly, and yearly cost and income allocation. You can also apply Net Present Value (NPV) discount rates and internal rate of return (IRR). The Cash flow view includes cost and income data in both table and chart format for the current schedule, results of analysis, and actuals. Just double-click on each bar within the Gantt chart to view histograms for duration, start and finish times, and cost, associated with the particular task. See Online Documentation for more information. Because real-life data is sometimes the only way to assess your uncertainties correctly, tracking is one of the most important components of RiskyProject. To track a task, you enter the percentage of the task done on the particular date. RiskyProject then calculates the projected task duration and updates the risk profile of the task. The project schedule is recalculated to give you a more accurate estimate of total cost, project finish time, and duration. These new results are then presented in the Tracking Gantt Chart. RiskyProject allows you setup project deadlines for tasks and projects and assign different actions to them. For example, tasks or projects can be canceled if the task or the project reaches the deadline. In this case, the success rate of the project or task (chance the project or task will be completed) is reduced. See Online Documentation for more information. You can now model weather and other calendar related event’s using probabilistic calendars. If your project has a 30% chance of running an inclement weather schedule, you can create this calendar with reduced hours of operation and run it 30% of the time during the project to model this calendar risk. Crucial Tasks are those tasks, according to the sensitivity analysis, whose duration has the most affect on a project’s duration and finish time are crucial tasks. Uncertainties related to critical tasks should be assessed and the risks associated with these tasks should be mitigated. Crucial tasks are displayed on the Gantt chart using distinct colors. RiskyProject comes with powerful reporting tools. You can output the project schedule from each step of the workflow. RiskyProject’s customizable Task Sheet and Result Task Sheet allow you to see task information in table format. The results can be printed, exported to the clipboard in graphic and text format, or exported to as a JPEG file. This is particularly useful if you want to publish results of your analysis to the web. Risk templates are standard sets of risks that allow you to quickly and simplify add risks to tasks and projects. A number of templates are included to RiskyProject package. In addition, it is easy to create your own templates, which you can use for your own projects. See Online Documentation for more information. For example, if you want to understand effect of mitigation efforts for a group of risks on project cost. To compare pre and post mitigation schedules, you perform an analysis without mitigation efforts and save the results as a baseline. Next, apply mitigation efforts, this can require additional tasks and costs and reduces the probability or impact of the risk in the current schedule. Finally, perform a cost comparison between the pre and post mitigation baselines. You can define mitigation plans using the Mitigation view. Mitigation plan can be execute when risk is occurred. RiskyProject will count, how many times the mitigation plan is executed. The diagram, which shows how often the mitigation plan is executed, will be displayed within a mitigation view. One mitigation plan will be executed only once per task even multiple risks occur. See Online Documentation for more information. Risk chart shows risks associated with tasks versus task duration or task cost. The risk is expressed as task standard deviation of task duration or cost, maximum, minimum values, ranges, or different percentiles (P10, P90, etc.). In a well-balanced project schedules, different tasks usually have similar level of risks. However, if the risk associated with a task is higher than for other tasks with similar duration or cost, these risks should be carefully analyzed and possibly mitigated. Alternatively, if a task does not have significant risks and uncertainties compared with other similar tasks, it may make sense to analyze the task uncertainties to see if they have been represented properly. See Online Documentation for more information. Conditional branching allows the project to branch from one task to another task based on certain conditions. For example, if a feature development task takes longer than 2 weeks, this may be require shorter development time for other features. Conditions related to task duration, finish time, and cost can be specified for each task that has successors. RiskyProject checks these if then conditions during simulations. Different risks can coincide with each other. For example, bad weather conditions correlates with the delayed delivery of the goods. For each risk you can specify correlated risks or risks that may occur with a specific risk. See Online Documentation for more information. Optimistic (low) and pessimistic (high) project schedule can be displayed separately on Result Gantt chart. It gives you an opportunity to analyze different project scenarios. In addition to the Risk Register uncertainties in the RiskyProject can be represented using statistical distributions. Using RiskyProject’s intuitive interface, you can define ranges for the following task parameters: duration, start time, cost, and lag between task successor and predecessor.